Inside the best paid stock screener you would expect to find a whole bunch of useful tools, ready to use, with the ability to modify them easy to suit your needs. Here I’ll explain how easy it is to modify any of our pre-set filters to enable you to become a true market wizard. Our RSI stock screener pre-sets cover just about everything a trader could need, like crossing above 70, crossing 50, above 80 for 10 periods etc, however if you want to adjust them it’s really easy. Once you select the filter, you will see a small blue edit button next to it’s name. If you hit that the filter builder page opens, and here you can adjust the settings, add further filters or completely change it! Save, and it’s ready to use. Finding stocks that have unusual volume is a piece of cake. 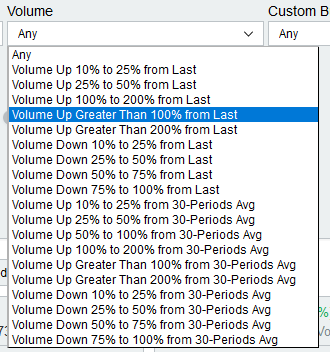 Already in the main filter we have a whole bunch of nice pre-sets, covering volume up 100% from 30 day average, volume up 100% from last bar etc. Again, to adjust them simply select the filter, hit the edit button and adjust it to how you need. You can also add another criteria, maybe unusual volume and rising RSI? Super easy, and takes 5 minutes. You can also filter by candlestick patterns. Which is a good feature, if you combine it with an indicator. Maybe you want to find doji candlesticks whilst RSI is overbought or oversold? Simply edit the pre-set and add those extra criteria into the boxes, and away you go. Another effective way to use our platform is to build watchlists around sectors or industries. You can keep an eye on which sectors are hot, and scan them for various patterns and select some potential winners. You can also build watchlists of stocks that have, as an example, recently moved above a long term moving average, or recently made a Golden Cross. Then run the filter exclusively on these watchlists for things like, RSI coming out of oversold, price making a new 30 day high, etc. There are so many ways to get the best from our paid stock screener to make your analysis easy, and find some winning stocks to watch. Try it free today and see how it can help you. Stock Monitor is the new, fast way to scan the market. Get technical analysis, watch lists and portfolios for monitoring your investments.